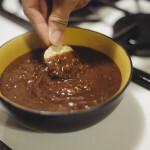 I know that many preppers think it’s silly to fixate on taste when it comes to survival food. If you’re in an emergency situation, they’ll argue, you’re unlikely to care about the taste of the food as much as you’ll care that you have food in the first place. They’re obviously right, but somehow that hasn’t stopped me from caring about the taste of prepper food in the past. 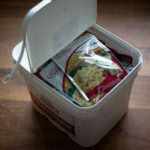 If I can get my hands on prepper food that’s pretty decent tasting, I’ll be happier to eat it during an emergency, which may in turn help me stay positive (and we all know how important psychology is to survival), in that good or even half-decent meal can do wonders for lifting your spirits. Besides that, I’m always concerned with what happens as I get nearer to the expiry date of survival food. Once that 20-30 year expiry dates rolls around the corner and passes, what am I supposed to do? Just throw the food out because it’s god awful to have to eat unless you’re desperate? I’d rather be able to eat through my long-term stockpile and restock, or give away the food to others who will be happy to eat it, rather than be forced to throw it away a few years after expiry because I know I can’t stand the taste unless I need it. If I get to choose between tasty survival food and terrible tasting survival food, I’m choosing the tasty survival food, even if it’s more expensive. Yes, I’ll probably buy budget MREs as back ups to my food stockpile back up if they’re dirt cheap, but if I get any choice, there’s value to me in survival food that will happily be eaten outside of an emergency. And that’s where Legacy Food Storage’s freeze-dried meals come in. 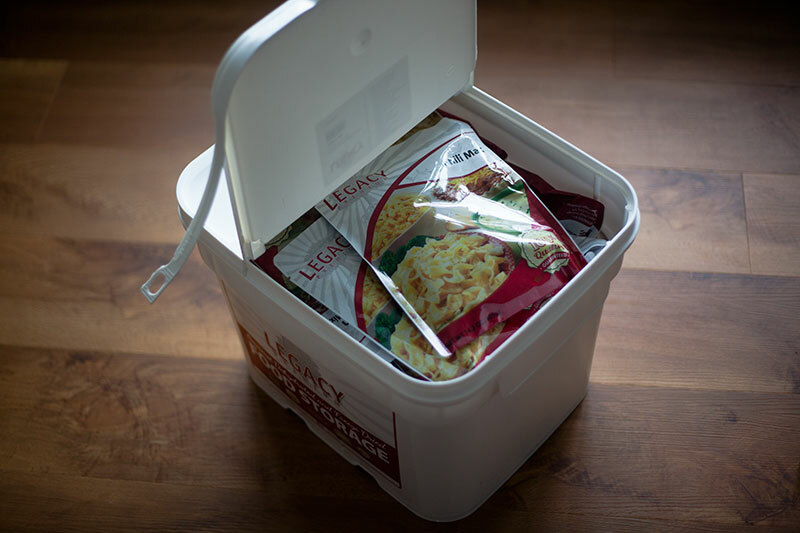 Legacy sent us this massive bucket of survival food to try out and do a review for them on. Full disclosure: we have not eaten everything in this bucket. That would take us an insane amount of time to accomplish. 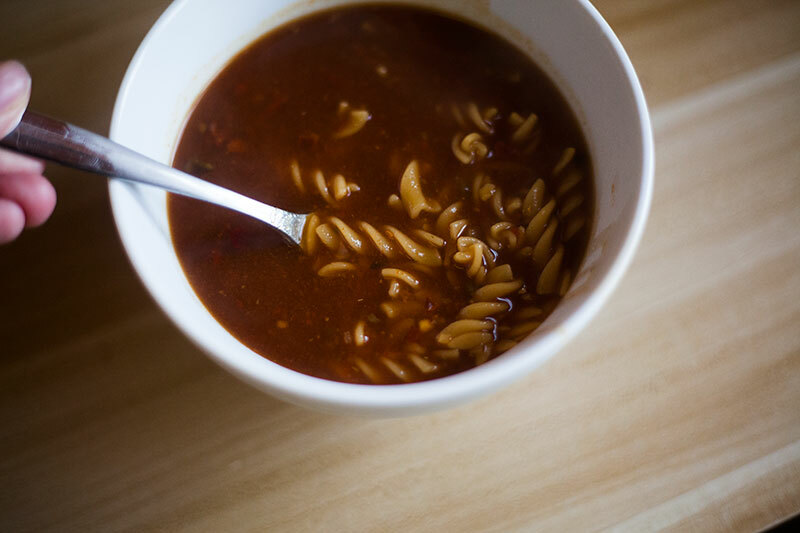 What we have done is try our best to try a little bit of everything, so we get a sense for how breakfasts, lunches, and dinners work – how pastas versus soups taste, that kind of thing. Yes, they’re made in the USA. They have gluten free options available (not everything LFS sells is gluten free, so if this is important to you, make sure you check out their gluten free page specifically). Their ingredients are non-GMO. Again, this may or may not be important to you, just thought I’d mention it since it might be. There’s no meat in their meals. You can buy meat separately and add it to your meals if you want, but this was a cost saving measure so your basics wouldn’t be too expensive. I thought it’d be more of an issue, but as I’ll get into later, it’s not, and I’m a carnivore. And that’s it for the preamble. Now let’s get into taste! 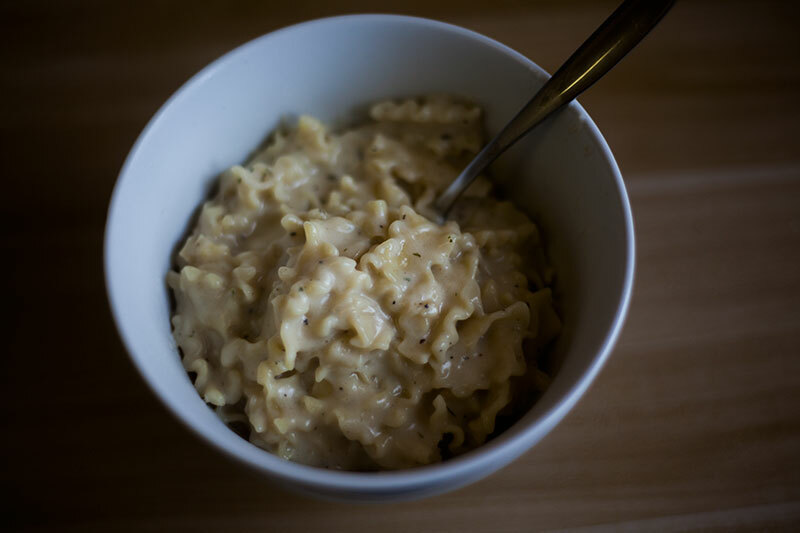 First thing I tried was their Pasta Alfredo, because let’s be honest, pasta is one of the best meals on the planet, and if they can nail this staple, I’ll put up with a bunch of average meals for some good grub from these packets. How did it taste? Hella nice. I am not a fan of the cooking instructions because following them means I get somewhat mushy pasta, and Thomas and I both prefer our pasta al dente, but who cares. Don’t use their instructions, improvise. It’s cool. We tried cooking the whole lot at once (we both hadn’t had much to eat) and trying to finish off the meal was a disaster. I am usually able to eat a metric f*cktonne of food, and obviously Thomas was helping me, but I was wrecked and could not for the life of me finish even considering how little I’d eaten during the day. 100% these are not single serving, and they are incredibly filling. Did I miss the meat in this dish? Not a single bit. That cheese made up for it in spades. And on the topic of that cheese, boy is there a lot of it on there. As Thomas likes to put it, not to his taste, but to my Canadian/American pallet – um hell yes. That cheese is where happiness lies, and like I said, completely made me forget about the fact that there was no meat. I added my own pepper on top because I’m a pepper junkie, but it’s not necessary. 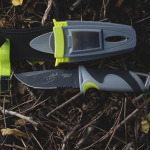 That being said, I’m guessing you’re stockpiling salt and pepper as I am, so why not assume you’ll have it and be able to add it to your survival food. It’s all the better for it, and honestly, this meal in the end tastes more like student food than it does like survival food. A++ for the pasta from me (especially if it’s cooked al dente; i.e. differently from the instructions). Next up was the enchilada beans and rice. Which again (apparently we didn’t learn our lesson from before) was way too much for one single dinner for Thomas and I, but we made the whole thing anyway. Tonnes of corn and beans, and from what I remember, enough heat to keep me happy. Yet again, I’m pretty sure the cooking instructions we would not recommend following, because mushy pasta + mushy rice is not at the top of our #favourites. Really would’ve preferred if Thomas had cooked the rice separately, but we learned our lesson this time and the next time, carbs were cooked separate and instructions were ignored. Still a damn nice meal, though. Thomas added his own hot sauce, I was happy with the result so I didn’t bother adding anything in this case. We’re both a fan of spicy things, and this was a lot better than some other flavourless ready made food on the market. 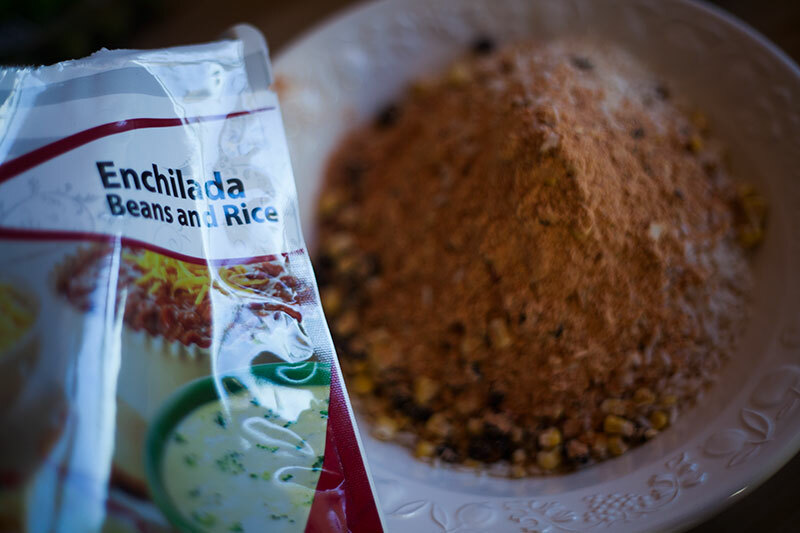 Haven’t had this dish from other prepper food companies, so I don’t know how it compares there, but I know for certain this I’d be happy to eat in an emergency and wouldn’t just be putting up with. Would I have preferred this one to have meat? Yes, probably. It didn’t make me forget the meat wasn’t there all together, but it certainly made me forget enough to enjoy the meal and not be thinking of what tasty thing I could have next to “change the taste in my mouth” to something nicer. When it comes to portion size, I think if we had split this meal into two and had it for dinner on two nights, it would’ve made for a reasonable portion on each night, not too filling, but not too light either. One pack is pretty good for two dinners for two people if you ask me. Again, not to be full, but it shouldn’t leave you all that hungry either. Especially if you’re supplementing with other food. Next pack up, the pack I was dreading the most. I. Hate. Soups. I really do. Soups do not compute in my poor lil’ head. Why someone would want a soup for anything more than an appetizer, I will never understand. 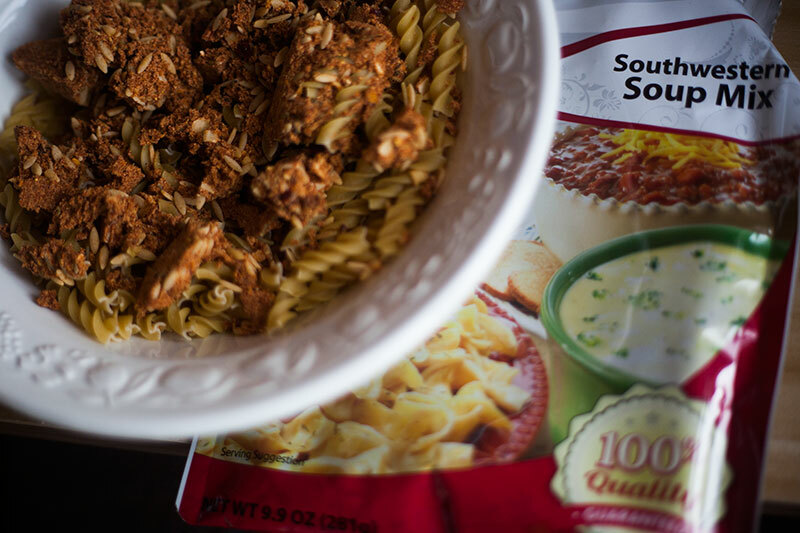 But I’m happy to say, folks, that Legacy Storage’s Soup Mix is not actually soup, it’s more like pasta in broth. And in case you’re wondering, yes, I do enjoy my pasta, thank you. Was it tasty? Again, yes, though this time that surprised me because I was certainly not expecting it to be nice to my taste. It had a kick from what I remember, and it was a pleasant kick. I think at most I added a bit of pepper to this one, and even then it was unnecessary. Once again, this tasted like student food to me, better than many of the ready made meals you can buy at a grocery store though obviously not as nice tasting as a home cooked meal (not my mother’s home cooked meals mind you; she’s not a very good cook and so this actually tops a lot of her cooking). Filling? Check. The pasta takes care of that. And since we ignored cooking instructions and made the pasta separately, we had it al dente as we would’ve liked, A+. Preferred over the Enchilada Beans and Rice, which as I said, I was certainly not expecting. 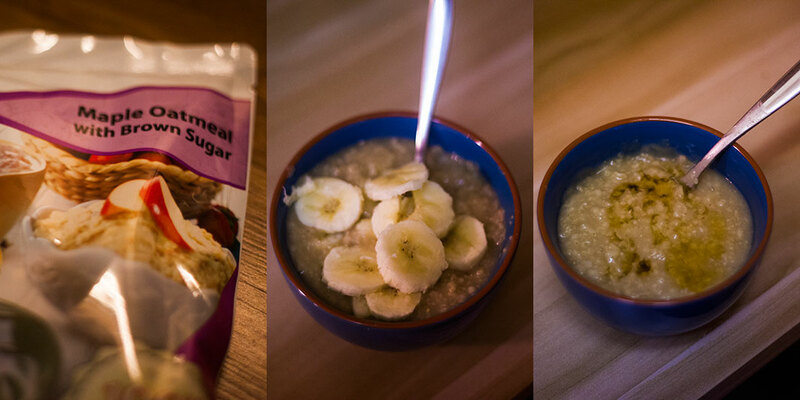 Finally – the Maple Oatmeal with Brown Sugar from their breakfast collection. I wasn’t sure it was possible for them to really go wrong here, and I was right, they did not go wrong. It’s oatmeal. It’s filling as all hell and this time we did not make the whole package, we made about a third of it, and still what we made was too filling for us to polish off. I kid you not I had one tiny bowl with a single banana on top and I was stuffed. 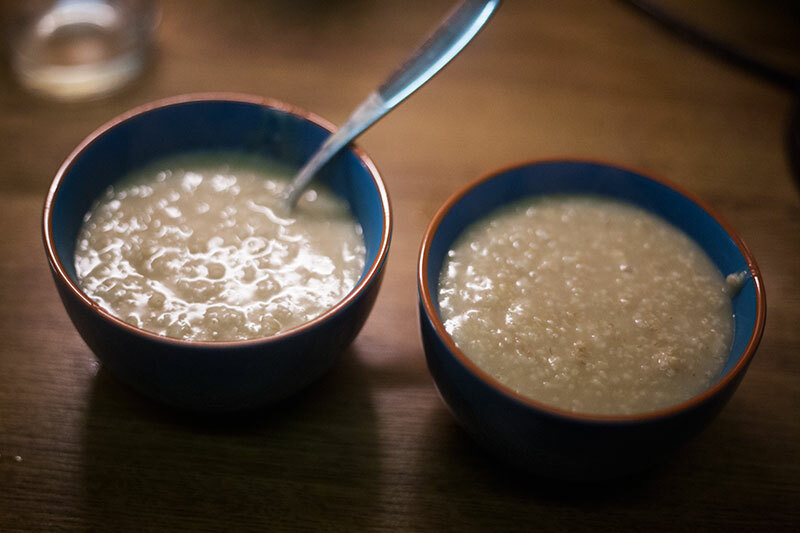 I don’t know if it’s that I’m just not used to oatmeal, and thus I get fuller off of it than I do off pasta or rice, or maybe I’d eaten too much else that day, either way, this stuff was crazy filling. This is the only meal I was not happy to eat on its own. I needed to add something to it to be happy to eat it, for sure. So did Thomas. I added a banana to mine, as I’ve said. I would’ve added cinnamon as well, but for some reason it seems we have none of that in our stockpile yet. Need to grab some when we go to the grocery store next. Thomas added honey to his because why not, and we happily ate as much as we could of this meal before giving up. There aren’t many survival foods I’ve actually enjoyed eating. Survival foods are typically the kind of thing you grit your teeth and get through because you have to. Every once in a while, you’ll get a, “Wow, that’s pretty good” product that you could imagine yourself eating without hating your life. 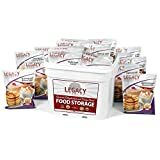 This isn’t one of those – this is actually a solid step above – if I was your guest and you served Legacy’s Survival Food to me as a regular meal because it was nearing expiry, I wouldn’t be too upset. Actually, I might prefer it over a home cooked meal if your cooking is anything like my mom’s. If I was a student looking for some easy-to-make ready made food that lasts a while and requires zero space in my refrigerator, I’d be over the moon with this. In terms of taste, it’s actually pretty darn good. And I’m really, really picky. 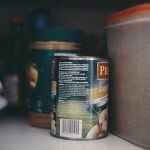 About the lack of meat – somehow Legacy Food Storage made me forget about my hangup over there being no meat in things. Okay, not somehow – the reason why is pretty obvious if you’ve followed along: they overdo it on the cheese, spices, and herbs, everything besides meat that makes food wonderful. Would I buy them for myself? Yup. If I could afford them, I would without batting an eyelid. 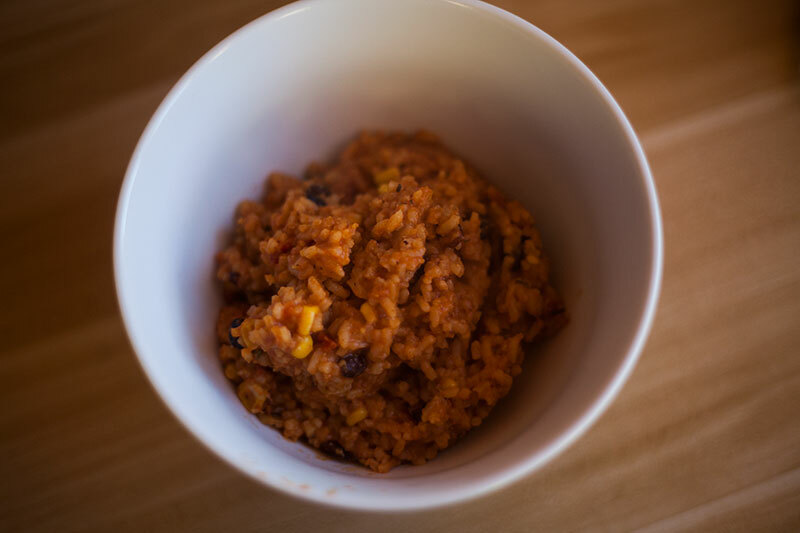 The taste is worth it to me, and while I’ll never see survival food like this as being particularly cheap, I do think the added taste and the boost I’d get from having food like this is worth the cost if and only if I have a budget high enough to accommodate it. No way in hell I would use this to start off a stockpile. But with a 2-3 year stockpile of cheap survival foods bought from a local grocery store, this is 100% the direction I’d love to go for my extremely long-term survival food. Of course, as I already said, I’d probably also have a bunch of cheap MREs stockpiled if they cost next to nothing, because why not, but those would be a back up to this back up if I could help it, as this back up is one I’d actually be happy to consume. I am sure it is wonderful. But it’s $5 per serving, $27 a day, $10,000 per year per person. There are much wiser ways to prep. Hi, Legacy here, actually we have volume pricing! Currently 1 year per person is much less at just over $2,100. That is $175 per month. $1.94 per serving. Our prices continue to go down the more you purchase! 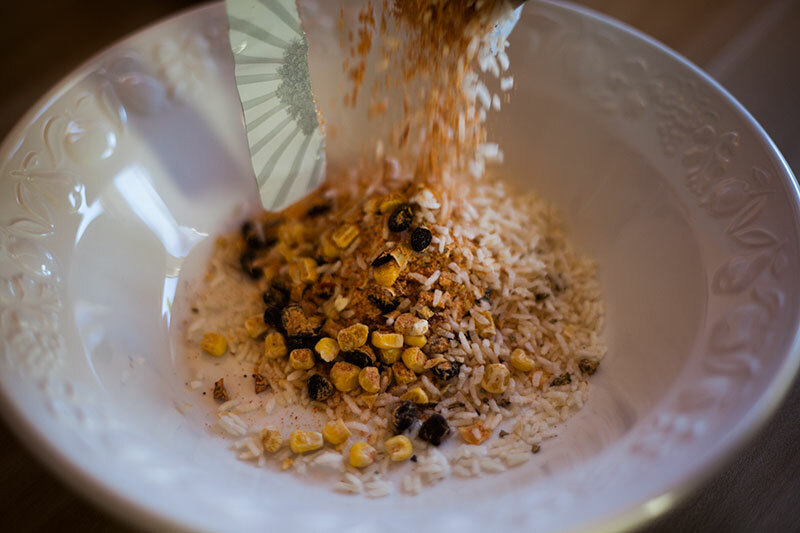 All food storage companies assume that you will be adding other items to the main course just as you would any other meal you currently prepare. Sides, drinks, etc. Some companies even give you these extra calories in their package, but its typically, desserts, sugary snacks or lots of rice/oatmeal to bump up the calorie count. 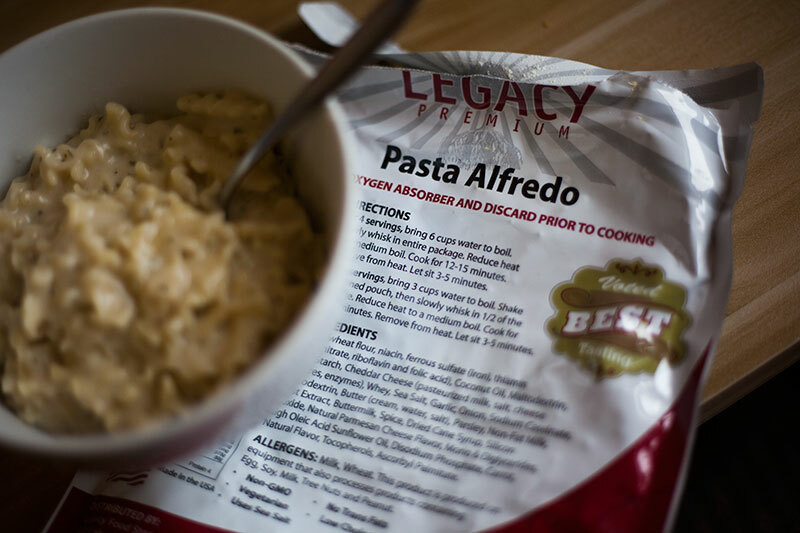 Legacy has chosen to offer the largest serving size of meals in the industry, so you have to add less to achieve your calorie goals. Our average calorie per serving is 371 which is higher vs any other competitor. The majority of our packages comprise of only the important main entree or breakfast selections only. 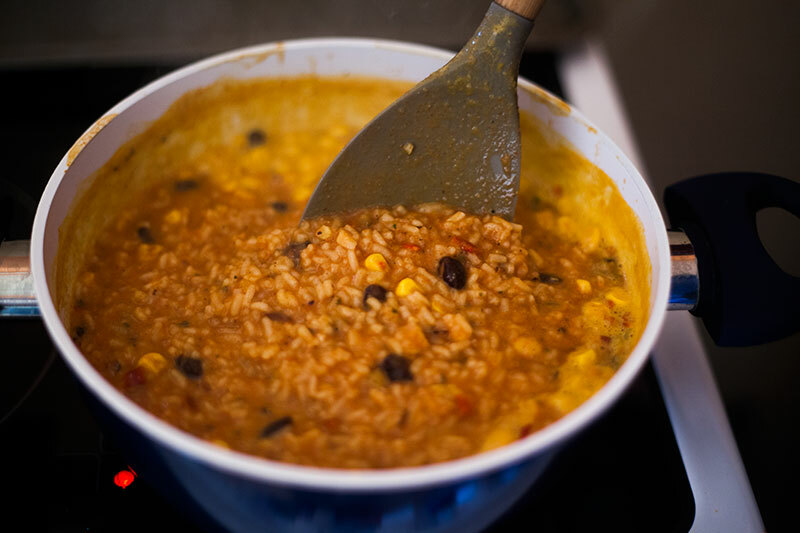 Simply adding rice and beans (which everyone stores right?) could add as much as 200 calories to the meal. Then we recommend you store healthier sides that you will enjoy. Potatoes, beans, extra vegetables and healthier fruits as a sweet option for dessert as example. Does that help? 4. you desire variety/change in what you eat. 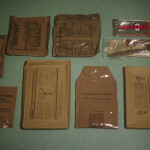 2. your MREs cost way more. 3. You get any fresh fruits or vegetables. A Mormon guy decided that he would purchase a year’s supply of food for his family. It took an 18 wheeler to haul it. He found that the family ate up all the “good stuff” before touching the more dreary/mundane foods and the experiment was terminated after a few months. 3. certain products will fail. Your plastic container for softdrinks and water will fail within a year. Beer and cigarettes start to go bad after a few months. 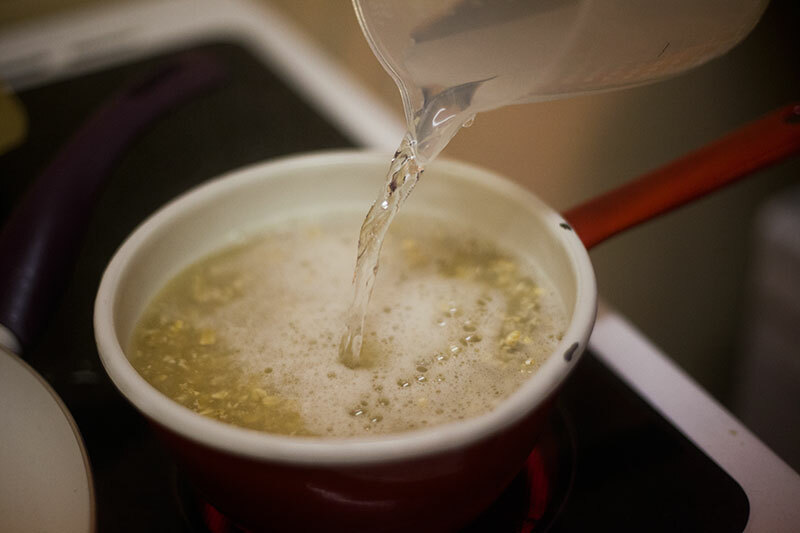 Bleach rapidly loses potency after 3-6 months on the shelf (yep, and you thought that your bleach was going to be good forever – absolutely wrong). Those technically are not food products. I have a few cases of small packages of flavored noodles/parboiled rice. They are used after the canned food is used up. Agreed. I’d say a bug in scenario where you’re standing your ground and want to make it so you don’t have to leave your own property for months is essentially the perfect use for these. Can think of many social unrest scenarios where this would be a plausible situation to find yourself in, especially if you’re a ways away from the heart of any cities. 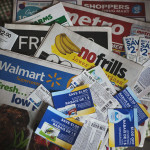 I think it’s great to have gardening preps, but they aren’t enough. I think it’s great to have short term food supplies, but again, they’re not enough (as what if you need more or if you were low on your short term stockpile when something bad happened). 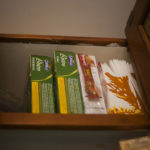 I love the idea of having something with such a long shelf life at home, something easy to throw into the trunk of the car if need be, to bug out with or to send over to someone else in need you might want to help. Dunno, a lot of uses for something like this in my opinion. A “year’s supply” will never last as long as companies try to advertise, but I think it’s ridiculous to “budget” food by anything besides your own calculations. We all know that 2000 calories is the benchmark, use that. And supplement this food! 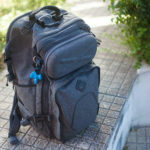 Depending on buckets by themselves to me is a little like depending solely on a survival kit for your own survival, it’s better than nothing, but you need to add to it what local emergencies that kit will not have prepared for – no matter how good the kit is, it will not be perfect for you. A great survival garden + enough of these, and a short to medium term (1-2 year) food stockpile, all in a middle-of-nowhere type bug in situation – that’s my idea of a good system. I will never ignore tins and long term expiry date grocery store foods, and I will never ignore having a half-decent prepper garden. But that still leaves a spot for foods like this in my preps, even though I’ll never trust them to be *absolutely enough,* and certainly wouldn’t use them for starting a stockpile or if I was on a very tight budget. There are better ways to spend the money on preps in those cases, which I’m sure no one in their right mind would argue against.